Just venture out on the market streets of any town or city in India and you will start feeling hungry seeing varieties of tempting Indian fast food there. Indian fast food market has evolved so much over last couple of decades, what has really remained the same are the temptations. Few years back the addition to this evolving market was frankies or kathi rolls; its so easy to spot those coloured banners selling all kinds of kathi rolls, vegetarian and non vegetarian, with single egg, double egg, single filling, multi-filling and what not! Why not make a more healthier option of these rolls at home? So I made these Paneer Kathi Rolls with a filling of locally bought paneer, spring onions, bell peppers and they turned out so delectable that I ran short of the fillings. Paneer Kathi Roll is a good option for any meal of the day as it is very filling and I suggest taking them out for picnics and office or school lunch. You can vary the spices in each roll to make it special for kids and adults and let everyone at home enjoy these. 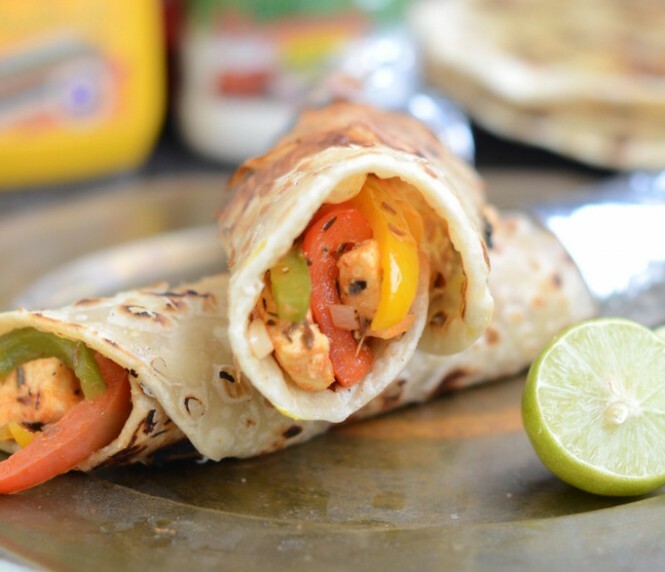 So here is a simple recipe for making Paneer Kathi Roll at home. Knead maida in a bowl to make a soft dough. Make roties and cook on a griddle using little oil. Add oil in a pan. Add bell peppers, paneer, onion, salt and red chili powder. Put a little ketchup, mustard sauce and mayonnaise on paratha. Put a little filling inside. Roll to make a wrap.